Kelly: Joyce and I have enjoyed Gooseberry Patch cookbooks for quite a while; In fact, I got her one for Christmas last year. We have found some excellent easy crock pot meals like Pepper Steak. 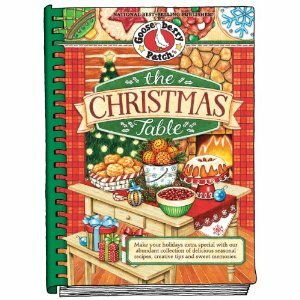 Now, we are proud to have the opportunity to review and give away a copy of their newest book, The Christmas Table. As I am planning my first old-fashioned family Christmas for twenty relatives, this book arrived at the perfect time. The Christmas Table is filled with delicious recipes for the holiday season as well as ideas for adding tradition to your family get-togethers. I loved some of the time saving suggestions. (I almost always forget to soften butter; Gooseberry Patch recommends using a cheese grater on the cold butter and letting it soften in a few minutes.) I plan on incorporating some of their sweet memory ideas like making all my guests give a Christmas wish and providing ornament place cards. Some of my early favorites from the plethora of recipes - the Cozy Christmas Brunch chapter's "Orange Spiced French Toast", Chill-Chasing Soup's "Southwest Butternut Squash Soup", and Caroling Party Supper's "Barbecups". Joyce: There were so many delicious sounding options in this cookbook that it was hard to decide what to make for this review. At first, I had a hard time taking my eyes off of the "Sweet Treats to Share" chapter, but when I saw this recipe, I just knew that it would be a hit with my family. Basically, if it is in the shape of a cupcake, my kids love it. I couldn't wait to try these Barbecups, and they did not disappoint. My three-year-old said, "Yummy in my tummy!" and the rest of us felt the same. These will definitely be entered into the regular rotation; besides being delicious, they are also so quick and easy! 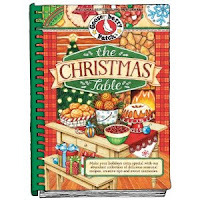 I am looking forward to making many more recipes from The Christmas Table. Grease 10 muffin cups. Preheat oven to 400 degrees. In a skillet over medium heat, brown beef with onion; drain. Stir in barbecue sauce and sugar; cook one minute. Separate biscuits; firmly press one into the bottom and up the sides of each muffin cup. Spoon 1/4 cup beef mixture into each biscuit; sprinkle with cheese. Bake for 10 to 12 minutes until biscuits are golden. Cool; remove from tin. Makes 10. These look so good, gonna try these this week!! They are amazing, January! :) Let us know how it goes!